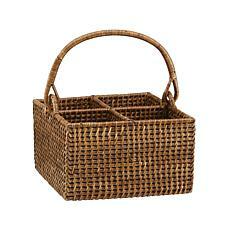 The French Chefs 4-Bottle Rattan Caddy Carry drinks or silverware, and set them out in style with this caddy. The warm, golden color of the rattan adds the perfect touch of natural material to your tablescape. Make entertaining and serving a little more special with this mango wood and aluminum tool caddy. Ideal for organizing forks, spoons, knives and napkins, you'll love the way these natural and industrial elements fit beautifully into your décor. At once eye-catching and functional, kitchen caddy storage turns your organizational essentials into home decor pieces. You can keep your silverware, cooking tools, napkins, and other essentials on hand and on display with these gorgeous pieces. Add French country appeal to your sideboard with a rattan caddy for your oil and vinegar bottles. Give your home a rustic look with a wooden tool caddy accented in metal. If you like to keep your flatware handy at mealtime, add a charming display caddy to your dining room table, complete with slots for knives, forks, spoon, and napkins. Set an elegant wrought iron hostess caddy on your buffet and your guests will always have easy access to utensils, condiments, seasonings, and other essentials. Kitchen caddy storage can organize anything from salt and pepper to a selection of serving tongs and spoons. In one smooth move, you can relocate these caddies anywhere you need them. Take dinner outdoors on a whim and bring your kitchen caddy storage to the patio. Move your serving spoons from the kitchen to the dining room so they're right where you need them. Purchase all your essential kitchen decor and storage pieces from HSN.